Upon removing the dust jacket, I see that the regular trade HC is bound in blue cloth, while the limited HC is bound in purple cloth. Very nice. For those readers who purchase the regular trade HC, that version has no Wold Newton Family tree chart on the end sheets. I've made the chart available at The Evil in Pemberley House website. 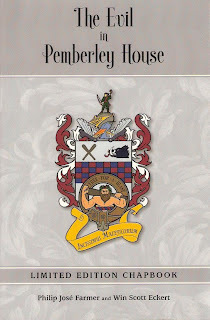 Just scroll down the right navigation bar to THE EVIL IN PEMBERLEY HOUSE - FAMILY TREE. Note that this version of the chart is Spoiler-Free; it does not give away any of the novel's mysteries. The Limited Edition HC has this very same Spoiler-Free family tree chart in the book's end sheets. The Chapbook that comes with the Limited Edition has the Spoilers version of the family tree on the inside front and back covers. I will not be making that version of the family tree chart available electronically, at least not for some time--you'll need to buy the Limited Edition for that. :-) From what I can tell, copies of the Limited Edition are going very quickly. All in all, I'm incredibly pleased, and feel very lucky. It's a beautiful package all around. Despite postal strikes and threats of postal strikes here in the UK my copy arrived today (actually yesterday but I was at work). I got number 141. Looking forward to reading it over the weekend. No probs Win. I hope there's plenty more in The Magic Filing Cabinet that can see publication and the light of day. Finished the book last night, great stuff. Congratulations on such a good book. Did a quick review via Facebook. A minor plot point for me is that I would have preferred Patricia to save herself against Moran (you must have read Lester Dent's Master Plot, hmm?). The last few chapters were fantastic. A great book, hope there's room for a sequel(?). But I do appreciate it. :-) As far as sequels... keep you fingers crossed. Thanks for the response Win. The Master Plot I'm referring to is the one Lester Dent used for writing all his stories, it's available on the internet somewhere, where he says the hero must always get themselves out of trouble through their own skill. The review was on iread or something, an app I have on facebook; have a look at my profile, it should be on there somewhere. 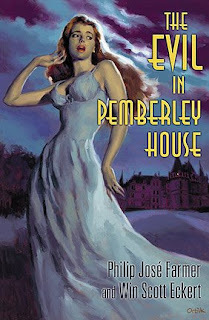 At its heart PEMBERLEY HOUSE is a Gothic, which has different conventions than a traditional pulp adventure. So despite using a daughter of a pulp character, the intent was not to pastiche a pulp novel. I discuss this a bit more in the interview I did online at the PJF Int'l Bibliography site. No probs Win, it's just a personal preference. I think it's more satisfying as a reader if the protagonist is pro active rather than relying on external events. I've had some time to read through the chap book too; I take it Saxon Blake is all yours, or did Phil Farmer have some input into it? All of the history of Sexton Blake's interaction with the 6th Duke in 1904 is straight from Phil's DOC SAVAGE: HIS APOCALYPTIC LIFE. We became slightly worried at a lack of clarity on Blake's copyright status, and decided to change his first name to J. Saxon, which is a name Phil came up with.